The Secretary of State of Wyoming maintains an online business search tool which helps the users to extract information of any business entity that is based in Wyoming. You can get information regarding an entity or corporation provided you have the filing name or the filing id handy. Below is a step by step guidelines on how to use the Wyoming business search tool. 1. The first step is to access the Wyoming business search page by clicking here. The page looks similar to the screenshot below. 2. The business search form allows you to search by filing name or by filing ID. If searching by filing name it also allows you to widen or narrow your search with the option to search by name that starts with or contains. For this example we will be searching by business name. 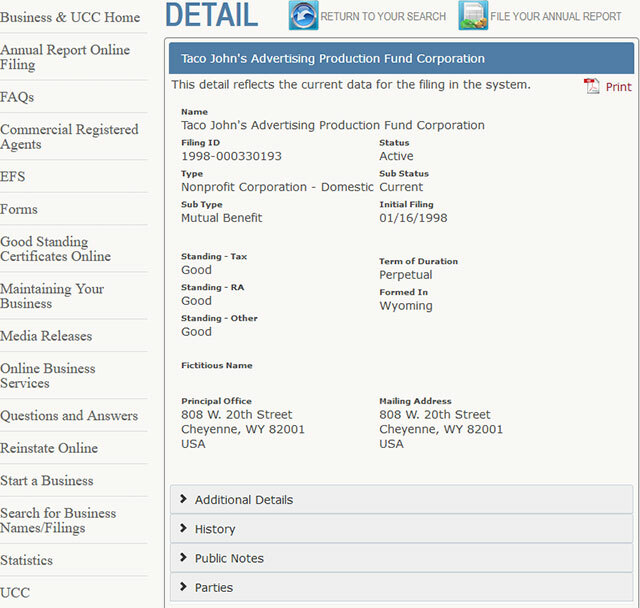 Go ahead and type "Taco John" in the "Filing Name" field and select "Starts With" as seen in the screenshot below. 3. When you click the "Search" button it will show you a list of results that matches your search criteria. It displays the entities name, status, current standing and filing date for each business found. Simply click the business name you want to view the details for, as shown in the screenshot below. 4. When you click a business name, it will take you the business details page for that entity. This page displays the entities name, filing ID, status, type, filing date as well as the history, public notes etc. You can see this in the screenshot below. The Secretary of State of Wyoming is one of the constitutional offices in the US state of Wyoming. The office is set up under the Constitution of Wyoming. The current Secretary of State of Wyoming is Ed Murray who has been serving the position since 2015. The Wyoming Secretary of State serves as the Governor of Wyoming when he is not present. 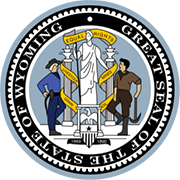 The Secretary of State of Wyoming is the keeper of the Great Seal of Wyoming and has the authority to authenticate and certify government documents using the seal. He is also responsible for keeping track of the acts of the Legislation and the Executive branch of the state. The Secretary of State of Wyoming is the chief custodian of the public records and the public archives.